So your company has decided to start pushing ads in the social-media-sphere. Great idea! After all, the audience segmenting capabilities of social media platforms allow you to pinpoint consumers based on demographics provided in user profiles. But you can’t stop there! While social media advertisements are ultimately used for a number of reasons (building brand awareness, recognition and relationships, starting conversations, etc. ), you want to test and use real time data to make sure these ads are giving you the return on investment you want. You need to test and keep testing. In this article, we will show you how to analyze your social media advertising KPIs using your spreadsheet. How exactly can you measure ad success you might ask? We’ve broken it down into three categories and eight different key performance indicators (KPIs) to think about so you can better understand and analyze your ad performance. If you still would like to build your own, let’s get started breaking down the rates and ratios you’ll need to set up in your spreadsheet. When you push an ad, you’ve got goal in mind. Most commonly, it’s to gain a certain amount of new subscribers, users or customers. Without the proper tracking of data from your ads, you won’t know if you’re even getting close to what you want to achieve. You’ll want to measure the actions taken as a result of your ads (i.e. conversions), and how much it will cost you. Conversions are the visitors to your site that “convert” into an actual customer. A conversion can be the result of watching a video, signing up for a newsletter, downloading a demo, etc. (something that shows that they are interested in what you are selling). In order to track a conversion through social media ads, you must include a pixel or url code to track the call to action you want your visitor to take (ie, go to your landing page) as a result from the ad. If you omit this, you will not be able to track visitor conversions beyond the given social media site where the ad was placed–and you want to know where they are coming from! Once you’ve set up pixels on your Facebook Ads, etc, you can calculate the conversion rate by dividing the number of conversions attributed to the ad campaign by the total number of people who performed the call to action from your ad in the given campaign. Social media platforms assign Cost-per-Click (CPC) in the form of a bid. Facebook has recently updated the way CPC is calculated, basing the cost more on actions taken than mouse clicks (a way they can charge you for more “quality” advertising results). Instagram, operating under the Facebook umbrella as of 2010, offers similar options, and LinkedIn allows you to place a max bid per click and set an allowance for any given campaign. For internal records, you can calculate this by dividing the total cost of your advertisements by the number of clicks they receive. Cost-per-Acquisition (otherwise known as Cost-per-Conversion) takes the cost of the campaign and divides it by the amount of conversions. This is a metric we pay a lot of attention to because it indicates the amount of money spent to obtain a potential new customer. Once you’ve placed your ad, its important to monitor it to know when to increase your spend or take it down. This is where money can be thrown away if you’re not looking at the right key performance indicators (KPIs). Think about it: your ad has flat-lined, is gaining no conversions but you continue to pay for it over the course of a month because you’re seeing thousands of impressions (can you say vanity metrics!) and this runs you about $20,000. You probably say to yourself you’d never do something like that, but if you don’t look at the right ad KPIs, you’re very susceptible to that risk. The following two metrics are often overlooked and they are responsible for saving businesses thousands of dollars. Fatigue Rate is the KPI that basically tells you the rate at which your ad is being ignored. In brevity, Ad fatigue factors in the number of Click-Throughs over the frequency that your ad is being displayed. This is a metric our campaign managers pay close attention to. 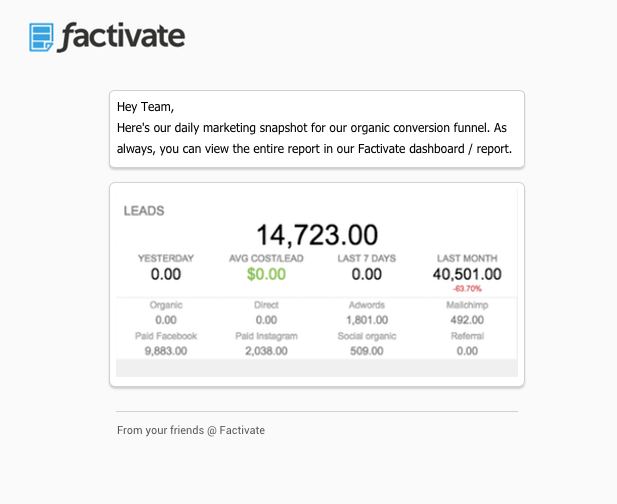 Since our campaign managers use our automated Factivate spreadsheets (which are updating 24×7), we are able to immediately spot when an ad is no longer profitable to us when we compare the fatigue rate, conversion rate, and $ per user converted. In such cases, we either tweak the ad or replace it. Quality Score is a metric that essentially tells you how relevant your ad is. The more relevant your ads are to your demographic, typically, the higher your click-through-rate will be. Facebook doesn’t provide a quality score metric for their ads but has recently started providing Relevance scores to their customers. This is not to be confused with the Quality Score that Adwords will typically provide. In Facebook’s case, think of the relevance score as the grade on your ad before you push it out – not how it is currently being perceived. Let’s consider a scenario that combines the two together: the fatigue rate of your ad campaign is increasing but the quality score is also high, this means your ad is hitting the right target market, but you are running the risk that your potential customers are overwhelmed with that same message. At that point, doing so AB tests for the ad might help you continue your upwards trend. Impressions refer to the number of times your ad is viewed or displayed on a web page. 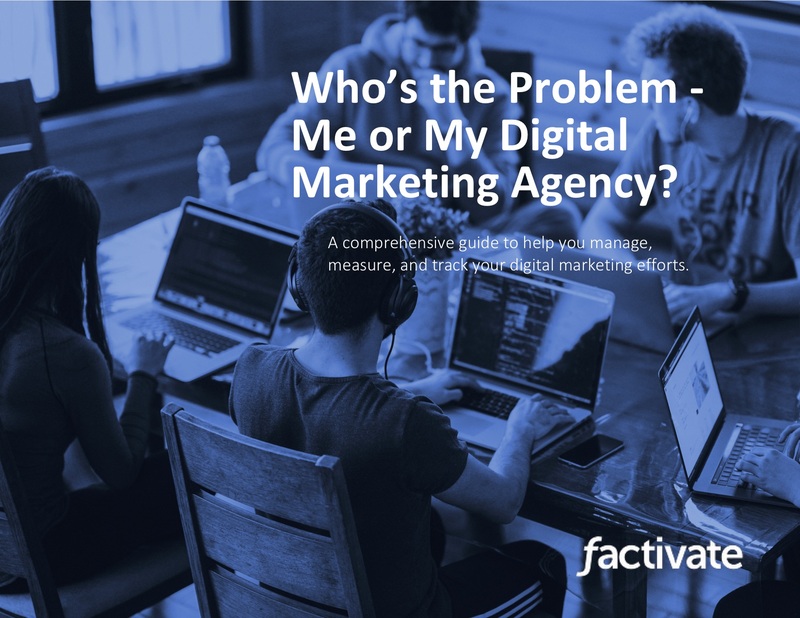 It’s a great metric to measure how many people your ads are reaching, however, in order to gain further insight, you should reference this metric with the activity data points like number of clicks (which leads to your click-through-rate). Click-Through-Rate (CTR) is the number of times your ad is clicked divided by the number of impressions. This is a good indicator of how relevant your ad is to your audience. If your CTR is high, it usually tells you that your ad is effective in driving traffic. Bounce Rate considers the number of people who click-through your ads, but immediately leave the next page. High bounce rates are a huge indicator that there is a problem somewhere in your campaign, content, or even design. In that case, the advertisements with good CTRs can grab the attention of your audience, but either don’t accurately represent what you’re selling or the landing page isn’t meeting the needs of what you are trying to achieve so they bounce. Hopefully these rates and ratios help you get an idea of how beneficial it is to track you ad campaign data. You can now begin building your own spreadsheet to optimize ad spending (and budgets) by implementing these KPIs! Don’t want to build and always update your own spreadsheet? You can check-out ours here!